Welcome to the 2009 Peregrine season! I am REALLY ready to go this year and it would seem that I’m not the only one! I am pleased to say that many diligent folks braved the astonishing cold in pursuit of our favorite feathered friend over this long winter. So, to start things out, I’ll go over some, but sadly not all (as I know I’ll space a few), of those sightings. In late October, I received email from Midwest Peregrine Falcon (Flickr) group member Brian saying he’d seen a lone peregrine out near Bolingbrook. Brian is one of the best photographers in that group and he managed to get a beautiful picture of the bird complete with leg band information (make sure to read his picture caption – hilarious story). We identified her as Fermilab’s Kentucky girl, Neomi Jo (b/r P/*L). In January, Brian sent another email with photographs. He’d seen a lone peregrine about a mile from where he saw Neomi Jo in October, but this time couldn’t get close enough to get the bands. Mary and I studied the pictures side-by-side, but couldn’t say with any certainty that the January bird was Neomi Jo. That said, we do remain very hopeful that it was and that she will establish her nest this year. Anyway, way to go, Brian! Just a quick note to let you know that both mom and dad (I assume it is them) are sharing the same ledge at the prison on the EPA side, in the shade. I have seen one at a time over the last week or so, but this is the first time I have seen them together on the same ledge. They must be discussing how the Sox are going to do better than the Cubs in the post season. Hee hee hee…it’s no wonder they are Sox fans – they sport the team colors year around! I, too, have seen the jailbirds regularly throughout this long, very cold winter. I sincerely hope that they decide to nest on the EPA side of the jail this year, both for my sake (much, much easier viewing angle) and for the sakes of all their faithful fans at the EPA. Oh, and I know I’ve said it before, but this season I REALLY feel it – this year will be the year I finally get a perfectly clear picture of Max’s bands, so be warned, Max! In November, I got an email from another Flickr buddy pointing me towards a set of pictures taken at the top of Museum One, a large skyscraper a few blocks west of the Field Museum. 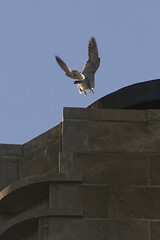 Last year, this building was a favorite hunting perch for our museum peregrines (Helen and Mr. M.). I have seen one or two peregrines soaring around the top of that building on about 10 occasions throughout these winter months. In the last few weeks, I’ve been keeping a closer eye on the museum roof, but I haven’t seen any signs of the museum pair yet. I have, however, seen the museum’s kestrel pair at least twice a week! Some of you may remember that last year, I spent a great day with my mom tracking a pair of peregrines up north, on the Loyola campus. Mom and I found a banded juvenile (probably male) molting into adult plumage hanging out with a bigger (probably female) unbanded adult near the south end of the campus. In December, Mary and I began getting email from one of our north side peregrine monitors, Deborah. Deborah lives in Evanston and has been a long time admirer of the Evanston pair (“Nona” and Squawker). Turns out, she’s lucky enough to have that pair near her home and another active pair where she works, on the Loyola campus! In fact, I think Mary dispatched me to Loyola last year based, in part, on sightings by Deborah. I just left off watching the Loyola peregrines screaming and dive-bombing a Great Horned Owl sitting in the crook of a tree on the side lawn of Piper Hall, the building just to the north of the Sullivan Center where I work. I only came upon the scene because I happened to go down to the break room which has windows looking north. Imagine my surprise to see one of the peregrines (the female, I think), repeatedly flying low just to the east of Piper Hall, swooping down over a particular area, then disappearing over the roof of my building or to the west towards Damen or Mundelein, only to reappear a moment letter swooping down again. The screams were faintly audible from inside. After a minute or two both peregrines were in on the action, flying together around and over the same area and appearing to dive-bomb something I couldn’t see, so I went outside, sans any outerwear, to investigate. I walked outside into the sound of their angry sounding calls, through the snow – in my clogs – toward the area they were screaming and swooping down at right above me. The focus of their attention includes an area featuring a large tree with a trunk that splits off in a Y about ten or twelve feet up. And there, in the crook of that Y was a beautiful GHO – either a male or a smallish female from what I could tell without bino’s. It camouflages so well with the tree trunk that it only came into view gradually as I stared. I saw it flinch as one of the peregrines actually struck it with its wing on one low swoop. Amazing how a wimp like me can be entirely impervious to the bitter cold when transfixed by such a display. What a story! Deborah also reported some early courtship displays between the two, so Mary and I decided to do some reconnaissance. On February 2nd, a brutally cold day, we met up with Deborah and the three of us spent about 5 absolutely freezing hours watching a beautiful pair of adults hunting off the roof of Mundelein. While we can’t say for sure this is the same pair, I will note that one is unbanded and one has black over green bands (same as last year’s juvenile), so it seems likely. The following much warmer (though much windier) Saturday, Sean and I made a last-minute decision to head up that way. In the few hours we spent watching, we saw only the unbanded bird, but I’m sure the other peregrine was around somewhere. Anywho, I would be surprised if this pair didn’t nest somewhere on campus this year. Can’t wait! Aaaaand finally, another campus pair – the University of Chicago peregrines. A few weeks ago, I happened upon some gorgeous pictures of Magnolia and “Eddie”, her mate. Although the pictures were from 2007, I contacted the photographer and he got right back to me. Derek works on campus and has been watching the peregrines there for a few years now. Mary and I were delighted to hear that he had hundreds of pictures and would be more than happy to let us take a look. Yay!! He also told us that he’s seen the pair about twice a week lately and would be happy to keep an eye out for them. Since that pair is SO hard to track down, this was very welcome news indeed. Just to note, Magnolia was born in 1991, which makes her a stunning 18 years of age this year – by far the oldest peregrine we have in the Chicago area. Other notable elders are Uptown’s Zoom (F) and UIC’s Rosie (F), both 12 this year, and the jail’s Hercules (F) and Broadway’s Tracy (M), both 11 this year. On to another nest. I am very pleased to report that the Pilsen folks have reported pair activity around their nest box. Last year, you might remember the female, Bryanne, died shortly after she laid eggs. Although the male tried to make a go of it on his own, the eggs did not hatch. It’s great to know there’s a pair active around the box this year and I am keeping my fingers crossed that it is the same male (“Lynn” b/g L/N) with a new mate. Last but not least, the Evanston Web Cam is back up and running and we already have pictures of the adults checking out the nest gravel. Man, those two Evanston falcon’s are always such early birds! Deborah has made a yahoo group devoted to the Evanston falcons called The Evanston Peregrine Falcon Watch and it already has 19 members! It will be an excellent place for people to log their Evanston sightings and/or keep up on the happenings, so if you live in the area, join the group! So, there it all is! As always, I’ll keep you all posted from here. Happy peregrine watching! ~ by Steph on March 4, 2009. Is a regular peregrine the same size as your stuffed peregrine? Does it have a broad tail or a narrow tail. I swear I saw a bird yesterday that may look like Neomi Jo hanging out at Argonne. We’re only 10 miles from where the photo was taken. I know I keep calling you about this bird, but I really have no idea what to look for. No, they are much bigger than the one I have on my desk, which is about the size of a kestrel (desk: 8″, peregrine 15-20″). They are about the size of an American Crow, if that helps. The peregrine has long wings and a shorter tail. In fact, the very tips of their wings comes about down to the end of their tail. If you see them in flight, the tail will appear sort of squared off with bands on the underside. If you are in good lighting, you may even see the yellow of their legs tucked up under their belly. If your guy has a long tail, he might be a Cooper’s Hawk. If he’s pretty small (like my desk peregrine) and has a long-skinny looking tail, you might be seeing an American Kestrel. Kind of hard for me to say without peeping the bird myself. We’ll have to go out there sometime this spring and see what we can see. are there any events in Chicago that allow people to interact with falcons or a falconer? I actually don’t know any falconers personally, so I can’t help you with that. At present, it is illegal for falconers to have a Peregrine Falcon, as it is still on the endangered list. However, I know there are a few people, like Mary Hennen here at the museum, that have special permits to keep injured falcons. Mary does a few educational programs a year, but they are generally by request from specific institutions. If she has a more public show, I’ll try to post it here. The closest thing I can get to an answer might not actually be what you are looking for, but every year, the banding at the Evanston Public Library is open to the public. You can watch as Mary and Matt (I usually don’t go inside for this, as I’m set up outside to get band numbers and such off the adults) band the babies. Although you can’t touch the birds, it is pretty up close and personal. Hope that helps! Peregrines that have been bred in captivity are legal for falconers to own and fly. Additionally, in a couple of western states (where populations are very high and the species is not listed), a very limited number of falconers may also take a nestling with a permit. Just thought I’d clear this up. Thank you for your correction, Bernie! It also reminded me to add your link to the page! I haven’t noticed any comments on the Wacker Dr. nest yet. Any news? The lunchroom where I work has a good view of that ledge and the south nest box, which is the one they used to nest in last year. We had a good view all last year. However, this year they must be using the north nestbox, which we can’t see, because we can see the birds (and the poop), but they’re not in the south box. Just wondering if you heard anything yet. I have been watching an adult and 2 juveniles this evening in Edgewater across from my building on Kenmore. I’ve lived here for 2 years and this is the first year I’ve heard and seen a Peregrine in this neighborhood. I had had a doubtful sighting earlier in the week. This afternoon Wednesday July 15 at about 4:15 PM a large brownish striped bird fell dead from the sky at the intersection of Dearborn and Elm, about 20 feet south of the corner and into Dearborn maybe 5 feet from the curb on the west side of the street. We had just crossed Dearborn when we heard a loud WHAP and there he was on his back, dead. From the online pictures I think he was a Peregrine Falcon, in case anyone is monitoring the death of the falcons. Sorry folks, wasn’t sure if this is relevant or not. But, this morning I watched what appeared to be a Pregrine Falcon chasing several crows at Donovan Park in Bridgeport. At first I wasn’t sure what was going on but then he/she landed on the bleachers and just stared at me. then took off after the crows again. Donovan Park is located at 3700 S. Sangamon on the South Side of Chicago. Over the last few weeks I have spotted the remains of several small birds but just figured it was the work of cats.